This simple tapa is served as a bar snack throughout Spain. The quantities are deliberately vague--this is a recipe you can (and should) improvise. 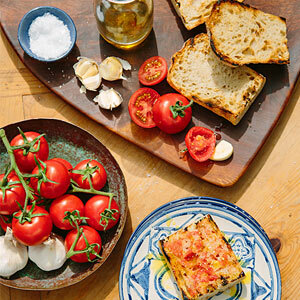 Make it with ripe local tomatoes and the nicest olive oil you can afford for the best flavor. Rub cut sides of bread with cut side of a garlic clove half, followed by a tomato half. (The toasted surface will act like a grater and capture the pulp and juices of the tomato.) Drizzle bread with olive oil and sprinkle with salt.